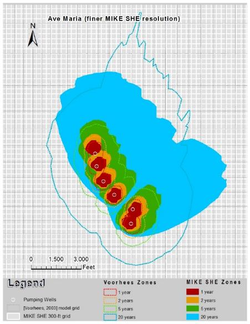 The Collier County contracted the services to evaluate the feasibility of using the MIKE SHE/MIKE11 software with the particle tracking module in order to define wellhead protection zones. LAGO imported model inputs from the previous model (that has been used in the past to define wellhead protection zones for the County) into the MIKE SHE/MIKE11 County-wide model. The particle tracking analysis was used to obtain the capture zones around the well fields for 1-, 2-, 5-, and 20-years period. One telescoped model at higher resolution is also developed to illustrate the benefit of using higher resolution. The modeling study indicated that the county-wide MIKE SHE results were very good at producing comparable results as the previous model for the 20-year wellhead protection zone. However, due to the coarseness of the model grid, the 1- and 2- year protection zones were not well defined. On the other hand, the results from the telescoped model were considered to be satisfactory for the 1-, 2-, 5-, and 20-year wellhead protection zones. It was concluded that high resolution MIKE SHE models would be appropriate tools for using in completing future wellfield vulnerability assessments.